I discovered some prepared Texas black bean and corn salsa at my local grocer over the summer. It was a tasty diversion, even with its simple ingredients in an Italian dressing base. Yet, with that latter ingredient, I suspected that it was not really authentic. Rather, it appeared to depend on the simplicity of ingredients and the gullibility of the consumer. I decided there must be a original recipe closer to the source, made from fresh ingredients. I did some research and developed this recipe by combining the best of the recipes found across the Internet. 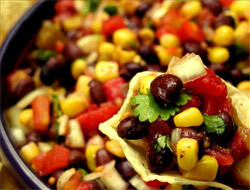 The ingredients are a combination of prepared items, the black beans and corn by example, and fresh ingredients. All of these can be found at your local grocery store. The result is a fresh, tasty, and bold black bean and corn salad. 2. You can use either yellow or white corn; I prefer the latter. Drain and rinse black beans in colander, add corn and set aside. Combine next 7 ingredients: tomatoes, red onion, green onion, garlic, jalapeno, red pepper, and cilantro, then toss with wooden spoon. Add olive oil, lime juice, and red wine vinegar, and toss again. Add black beans and corn, and toss again. Add cumin, and toss thoroughly. Add salt and pepper to taste; toss again. Refrigerate for 1 hour (longer is better). Toss before serving with favorite tortilla chips.